Ketchikan, Alaska - For more than 70 years, KPU - or Ketchikan Public Utilities as it is officially known - has been a constant, and sometimes controversial, presence in the lives of local residents. When the city of Ketchikan decided to purchase Citizen's Light, Power and Water from a Minneapolis holding company in the mid 1930s, Ketchikan became the first community in the United States to own water, telephone and electrical utilities. But the complete history of utilities in Ketchikan predates KPU by a good 30 years. As with everything else in the tiny collection of shacks that became Ketchikan in 1900, community utilities centered around Ketchikan Creek. In addition to providing fresh water for the community, the creek and its thundering falls was also tapped as a source of early electrical generation. Several private individuals built flumes and water wheels along the creek to harness the water, but the first to see the big picture was apparently Juneau resident Watson J. Hill who made a proposal to the Ketchikan city council in 1901 for a franchise to create Ketchikan Light and Power Company. Unfortunately, according to local historian June Allen, Hill went back to Juneau and no more was heard about the Ketchikan Light and Power Company, at least for the next couple years. Ketchikan's power and water needs continued to grow as the town population doubled to more than 1,000 people in the next year and a group of local residents - with the backing of some outside investors - petitioned the city for another utility franchise in 1903 and the Citizens Light, Power and Water Company was granted a 15-year charter. One of the company's first tasks was working with local contractors to build the first dam on Ketchikan Creek, just about a mile inland from the mouth of the creek. A 15-foot high dam was built, as was a flume to carry water to a power house which would be located on the creek beneath the main falls near where the Mary Frances garage is now located. When the water in the creek is low, you can see the remains of the Pelton Wheel from that power house in the creek mud. But then a snag developed. "Watson J. Hill again arrived from Juneau - this time with an injunction," Allen wrote on SITNEWS in 2004. "Work on the creek was halted until December 1903 when Mr. Hill agreed to sell out his interest to Citizens Light & Power. He left town immediately after." 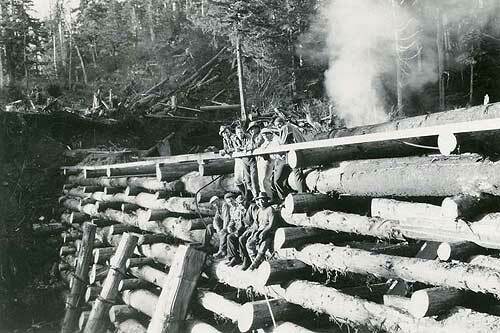 1903 was the also the year in which one of the mainstays of the local economy, the Ketchikan Spruce Mill opened up on the waterfront at the mouth of Ketchikan Creek. H.Z. Burkhart had operated a sawmill for a mining operation on Prince of Wales Island at Dolomi for several years and decided his fortunes lay in the growing community of Ketchikan. Together with J.J Daly and C.M. Summers they started a mill and power operation called the Ketchikan Power Co.
Ketchikan Power Co. would eventually join forces with CLPW to attempt to meet the needs of the growing community. In 1906, a second dam was built, this one right at the outlet of Ketchikan Lake. Although the dam was only four feet high it was some 100 feet long. Also in that year a new CLPW powerhouse was built, primarily because there were flaws in the design of the first powerhouse that caused frequent outages. The new 120 kilowatt powerhouse was built on site of the current KPU power house on Fair Street. CLPW also built its first administration building in downtown that year, on Mission Street. In 1906, the New England Fish Company began construction on a cold storage just south of Ketchikan. From the beginning it was clear that the fledgling CLPW would not be able to meet the electricity needs for the cold storage freezers and NEFCO built its own 1,200 kilowatt hydroelectric plant on Whitman Lake eight miles south of Ketchikan. That hydro plant operated for nearly 50 years but was dismantled in the 1960s. The dam remains in place though and KPU has plans for possible hydro facility on Whitman Lake in the future. In 1909, a telephone franchise was granted to CLPW and by mid 1910, the first telephone books were printed. For the first few years, it was possible to fit all local numbers on a single page. 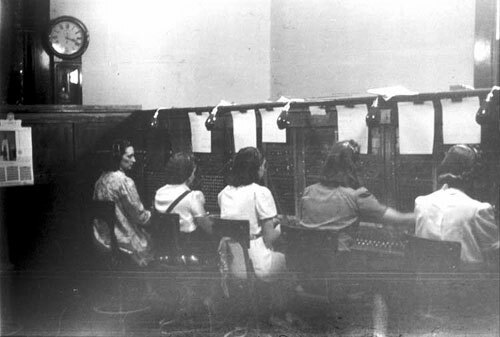 Like most communities, local telephone involved calling the operator and then getting patched through to the appropriate party. Up until the 1960s, it was still common in Ketchikan to share "party" lines with other customers. Although it was officially "discouraged" one could learn a lot about what was going on in Ketchikan simply by "listening in" on other people's conversations through the multi-party lines. 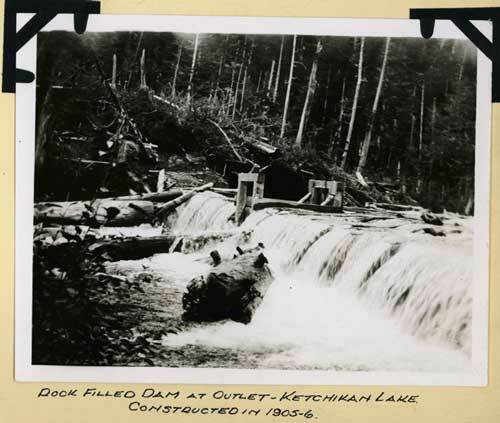 In 1910, the growing town needed more electricity and more water and so CLPW built a second dam, this one was between upper and lower Ketchikan Lakes. The two dams would cause the lakes to eventually nearly double in size and create a single reservoir with nearly 5 billion gallons of water, enough to supply the city of Ketchikan for more than three years if not another drop of rain fell. Throughout the 1910s, Ketchikan and CLPW continued to grow, but at a smaller pace than the hectic first decade of Ketchikan's incorporation. World War I further slackened the pace of development because many of the local mining industries were not considered essential to the war effort. But things changed dramatically in the 1920s as Ketchikan's economy roared headfirst into the era that made Ketchikan the "Salmon Canning Capital of the World." By 1920, it was clear that Ketchikan's economic progress, as personified by the canneries popping up all along the waterfront, was being hampered by a limited power supply. It was a scenario that would be repeated again and again over the next 87 years. CLPW was granted a new utility franchise and immediately began expanding the capacity at the Ketchikan Lakes generators but it was clear that only so many kilowatts could be squeezed out of the single power station. Steps were taken to expand capacity. A dam was built on Carlanna Lake, above Ketchikan's west end. More penstocks were drilled into the mountains around Ketchikan Lakes. 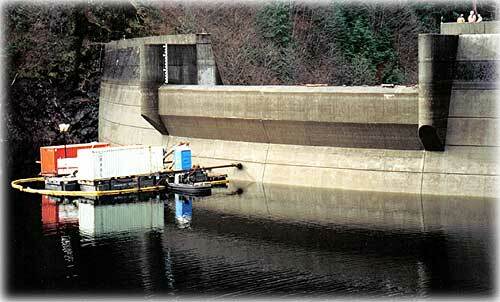 There was an initial plan to build a hydro facility at Beaver Falls, on George Inlet 11 miles south of Ketchikan. 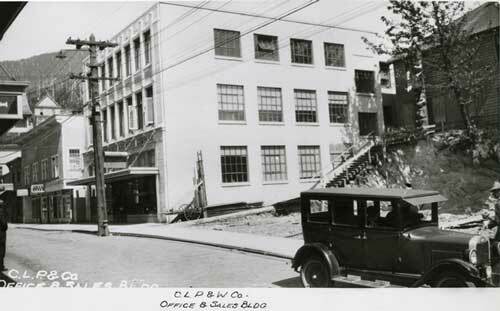 In 1925, CLPW built a new three-store administrative office building on Front Street. It would eventually become the Ketchikan City Hall building. But then the Depression arrived in 1929 and the outside company that now owned CLPW was hit hard. In 1932, the city council decided to purchase the failing utility company. Some in the community were opposed to the action, primarily because it was estimated it would cost more than $1 million to buy the assets of CLPW. In 1933, after much debate, the community voted 344 to 88 to bond up to $1 million for the purchase. "Since then there have been court fights, election campaigns in which municipal versus private ownership was the issue and endless legal disputes," the Ketchikan Chronicle reported on June 25, 1935. "Finally, a bill validating the entire procedure was put through Congress and signed by the President May 15 of this year." On June 25. 1935, Citizens Light Power and Water went out of business and was replaced by Ketchikan Public Utilities. Ketchikan was the only community in America that owned its power, water and telephone service. The final negotiated cost was $954,970. Initially, there was much local concern that the Ketchikan wasn't cut out for utility management, according to Allen. "The first few years of city ownership didn't go so well," Allen wrote in 2004. " Electrical rates went up even though financially stressed customers sometimes sat in the dark to save money and had thrown away electric heaters." Then World War II intervened and sitting the dark - during blackouts - became a a lot more common. When the war was over Ketchikan's economy was - once again - at a crossroads. The salmon canning industry was shrinking as were the great fish runs that made it possible. But local officials were already looking toward another industry to revitalize Ketchikan, the timber industry. By 1947, it was clear that a large pulp mill was likely going to come to Ketchikan. The pulp mill would probably generate its own power through a dam at Connell Lake. But what of the community itself? How would Ketchikan get enough additional power and water to handle the expected growth that the mill would cause? KPU began looking at two old options, Carlanna Lake and Beaver Falls. First Beaver Falls went on line, providing a new power source. Then the dam at Carlanna was expanded to add to the local water supply, particularly for Ketchikan's West End which found itself expanding rapidly to house the mill workers and their families. Another option was the purchase of diesel generators for the community. The diesel generators were to be used only to meet peak demands and for back up in case the hydros went off-line. Even in the 1940s powering Ketchikan with expensive diesel fuel was not a good option. These workers pose for the camera after rebuilding the dam. 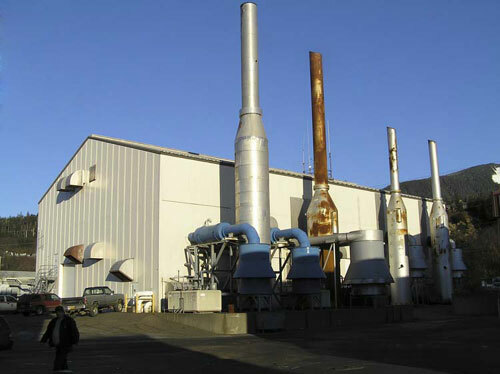 There was also the option of "purchasing" excess power from the pulp mill generators during non-peak production periods. It wasn't cheap, but it was available. With the coming of the pulp mill, the community population nearly doubled and that forced KPU to take a serious look at how water was provided. Carlanna Lake water began serving the West End and all city water was chlorinated by 1956. Eventually the water system grew to encompass nearly 36 miles of pipe and a yearly consumption of 1.5 billion gallons. In the early 1990s, there was a controversial proposal to put flouride in the water supply. It was defeated at the polls. By the early 1960s, the community was once again taxing out its hydro system. Again, a two step approach was planned. First, KPU planned to build another hydro power house. This one would be on Silvis Lake, just up the hill a mile or so from Beaver Falls. But community concerns about bonding for the multi-million dollar project sank two bond issues. It took nearly five years - and an seemingly endless number of blackouts and brownouts - to get community approval for the new dam. That led KPU to start a parallel track, one that would make the community rely on massive diesel turbines for more than just peak power. The Silvis Lake hydro when on-line in 1966, but in 1969 more than forty inches of rain fell in a four week period causing a massive landslide that wiped out the power plant. In the meantime, work was progressing on the Sheff Bailey diesel Power Plant near the mouth of Carlanna Creek. It would go on line in 1970 and provide enough diesel power to run most of the town in the event of an emergency or a water shortage in which lake levels dropped too low to the run the hydros. Eventually, a smaller diesel generation station was also built on North Tongass Highway. For a couple of years, things went well for KPU but then another heavy rainfall led to a second disaster. In 1973, the shoreline next to the Carlanna Dam eroded away and the lake emptied out, wiping out the Carlanna Creek bridge and cutting Tongass Highway in half. At first it was thought that the dam had failed, but that was not the case. Luckily, the nearby Bailey Power plant was not significantly damaged by the flood, but the Carlanna Lake dam had to be rebuilt and expanded at significant cost to the community. By the end of the 1970s, the community was once again nearly "tapped out" as far as power sources went and the diesel generators were running nearly all the time, causing residents to have to pay a hefty diesel surcharge on their utility bills. There was also concern about the reliability of the existing system as once again blackouts and brownouts became fairly common in the community. Working with the state and federal governments, the community pushed a plan for a massive hydro dam - bigger than all the rest of KPU's hydro's combined - at Swan Lake on the eastern side of Carroll Inlet. Swan Lake had originally been looked at for a hydro dam in the early 1950s during the pulp mill boom, but it was never developed. At the time of the Swan Lake construction, there was also interest in a second dam at Lake Grace, but that was within the area that was being considered for the Misty Fjord's National Monument and was thus off-limits to development. During the planning for Swan Lake it was also agreed that, eventually, it would be hooked up to the Tyee Dam which had more than enough power for Wrangell and Petersburg's future needs and would be able to sell excess power to Ketchikan which would probably be facing a power shortage again by the early to mid 1990s. At the time there was also concerns that the development of the Quartz Hill molybdenum mine could add as many as 5,000 additional people to Ketchikan in the late 1980s and further strain the local power system. Of course, that development did not take place, but it remains a future possibility. In 1984, the $96 million dollar, 22.5 megawatt Swan Lake hydro went on line and - for a time - Ketchikan's energy lust was sated. Ketchikan's growth slowed in the 1990s, primarily because of cutbacks in the timber industry, although the rapid expansion of the tourism industry did much to offset the timber decline. But when the Ketchikan Pulp Co. mill closed in 1997, the permanent year round population of Ketchikan dropped and power use fell with it. More than a decade later, the population is slowly rebounding. In the late 1990s, the state agreed to go ahead with the nearly $100 million Swan Lake-Tyee intertie line. The right of way was cleared and many of the power line foundations were put in place. But then the state and the federal government got into a dispute over who would fund the second half of the construction and work stopped when the initially $50 million ran out. After a two year delay, the state agreed in 2006 to fund most of the rest of the intertie construction and the project is back on track to be completed by 2009. The Swan Lake Project is located approximately 22 air miles northeast of Ketchikan, Alaska, on Falls Creek which drains from Swan Lake to Carroll Inlet on Revillagigedo Island. Date of photo unknown. Up until now, Ketchikan has been on what KPU calls an "islanded" system. Unlike most utilities in the Lower 48, which are connected in massive multi-state electrical grids, Ketchikan is truly an "island" unto itself when it comes to power generation. But that will change when the interetie goes on line. State officials hope that eventually most of Southeast will be hooked up to a regional grid that could then possibly be extended up one of the Pandhandle's river basin and hook into the BC Hydro grid system. KPU's water system also faces changes. In the early 1980s, an outbreak of giardia or beaver fever, was traced to Carlanna Lake and KPU eventually had to take the lake off the water system altogether in 1987. The lake is maintained in case the community needs the water in the event of a large fire or some other disaster. Meanwhile, Ketchikan is slowing moving toward secondary treatment of its water. A secondary treatment facility would meet federal water guidelines by using both ammonia and ultra-violet rays to purify the water supply. The treatment plant is expected to cost more than $20 million. 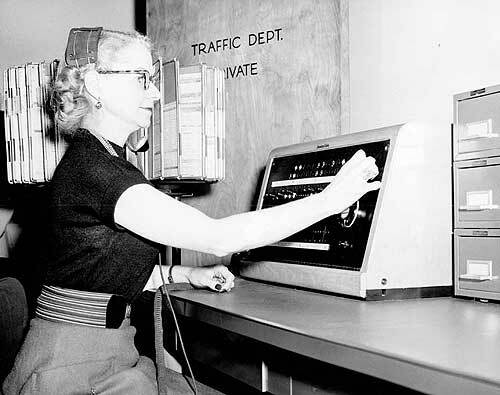 The KPU telephone division is also in a period of flux. Beginning in the mid 1990s, it faced competition from the rapidly expanding cell-phone and telecommunications industry. For the first time, KPU is also facing competition for local telephone service from GCI. It has countered by making its own foray into internet service in 2004 and cable television in 2006. As KPU approaches its 75th birthday in 2010, it is likely that whatever it turns into, it will continue to play a dominant role in the future of Ketchikan. Some information from the current Tongass Historical Museum Exhibit "A Tradition of Service: The History of KPU" was also used for this article. To republish this article, the author requires a publication fee.